PUEBLO NUEVO, Honduras , Nov 27 2014 (IPS) - In the heart of the Pijol mountains in the northern Honduran province of Yoro, the Tolupan indigenous community of Pueblo Nuevo has a lot to celebrate: famine is no longer a problem for them, and their youngest children were rescued from the grip of child malnutrition. The Tolupan indigenous people in Pueblo Nuevo are no longer suffering from the drought that hit much of the country this year, severely affecting the production of staple crops like beans and maize, as a result of climate change and the global El Niño weather phenomenon. For the last two years, the Tolupan of Pueblo Nuevo have had food reserves that they store in a community warehouse. The “black Junes” are a thing of the past, the villagers told this IPS reporter who spent a day with them. “From June to August, things were always really hard, we didn’t have enough food, we had to eat roots. It was a time of subsistence, we always said: black June is on its way,” said the leader of the tribe, 27-year-old Tomás Cruz, a schoolteacher. “But today we can smile and say: black June is gone. Now we have food for our children, who had serious malnutrition problems here because there wasn’t enough food,” he added. The transformation was brought about with the help of the United Nations Food and Agriculture Organisation’s (FAO) Special Programme for Food Security (SPFS), with funding from Canada. The programme employs proven technologies such as improved crop varieties and low-cost irrigation and drainage systems to bolster food security and nutrition in critical areas. An assessment by the SPFS identified serious malnutrition problems in 73 of Honduras’ 298 municipalities. Pueblo Nuevo and six other Tolupan communities in the municipality of Victoria in Yoro were among the villages with severe nutritional and food security problems. In the seven tribes, as the Tolupan refer to their settlements, 217 cases of malnutrition were detected among children under five. The other six communities are El Comunal, San Juancito, Piedra Blanca, Guanchías, El Portillo and Buenos Aires. But Pueblo Nuevo was the model community, because in two years it managed to eliminate malnutrition among its children. Pueblo Nuevo, home to 750 people, is a new settlement created after Hurricane Mitch devastated the country in 1998, claiming 20,000 lives and causing severe damage to infrastructure and the economy. According to official figures, one out of four children under five in Honduras suffers from chronic malnutrition, equivalent to 240,000 of the over 800,000 children under five in this country of 8.4 million people. The population of the country is 90 percent mestizo or mixed-race, two percent white, three percent Garifuna and six percent indigenous, according to official statistics. César Alfaro, the SPFS-FAO expert working in the area, told IPS that Pueblo Nuevo’s experience was a success because the tribe understood that they had to change their way of life, implementing good practices in cropping, hygiene and food security. The villagers, for their part, said Alfaro’s support was key to the community’s transformation. 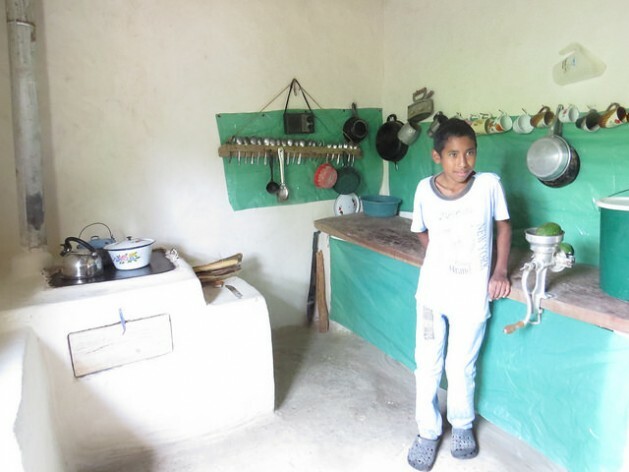 But Pueblo Nuevo is now a clean village, the locals have improved their wattle- and-daub huts, the walls are shiny and white, they divided their living spaces with the animals on one side and the kitchen with ecological stoves on the other, and they even have separate bedrooms. Located 200 km from the capital, Tegucigalpa, the village is an example of teamwork. Each indigenous hut now has a family garden, a chicken coop, and clean water, purified at a treatment plant run by the community. The malnourished children were put on good diets, under close medical supervision, and their parents now have basic knowledge and awareness about food, nutrition and the environment, which they are proud to talk about. One of the mothers, Estanisla Reyes, 37, told IPS that her five-year-old daughter Angeline Nicole, the youngest of her three children, had malnutrition problems in the past. “And how could we not be malnourished if we weren’t living well, if we didn’t work the land the way we should have? Our houses full of mud and garbage – that hurt our health, but now we understand. My little girl is healthy now, say the doctors, who used to scold us for not taking good care of them but who now congratulate us,” she said, smiling. She and her husband built the walls of their new kitchen, which forms part of the house, unlike their old kitchen, working 12 hours a day for 15 days. “My husband made the mix, and I brought the water, and polished the walls – many families worked like that,” she said proudly. Another mother, Adela Maradiaga, said “our lives changed. I came in as a volunteer because I’m from another tribe. I was surprised when I found out that my daughter was also malnourished. Then the Pueblo Nuevo tribe accepted me, and with the food we grow in our garden, our children are nourished and we are too.” She added that her children no longer have stomach troubles or a cough. In Pueblo Nuevo they are also proud that they don’t have to hire themselves out to work, or sell their livestock to ranchers or merchants in the area to eat. “We used to pawn our things, but now we sell them maize, beans, fruit and avocados,” said Narciso “Chicho” Garay. The tribe no longer uses the slash-and-burn technique to clear the land, and they now use organic fertiliser and recycle their garbage. They have a community savings fund where they deposit part of their earnings, which has made it possible to have clean drinking water and provisions. They managed to improve the yield per hectare of beans from 600 to 1,800 kg, and of maize from 900 to 3,000 kg, and now they know that a family of six needs 2,400 to 2,800 kg of maize a year, for example. Sandro Martínez, the mayor of Victoria, is one of the most enthusiastic supporters of the changes in Pueblo Nuevo, because he was born and grew up near the Tolupan indigenous people and did not hesitate to ask FAO to bring its food security programme to the native villages. “A famine in those villages in 2010 prompted me to look for help, and we found it. It wasn’t easy to start working with the Tolupan community; the success lies in respecting their way of government represented by the leader of the tribe, as well as their cosmovision. Now they say they’re rich because they no longer have to work for a boss,” he told IPS. There are seven indigenous groups in Honduras: the Lenca, Pech, Tolupan, Chorti, Tawahka and Misquito, besides the Garífunas, who are the descendants of slaves intermixed with native populations. The Tolupan number 18,000 divided into 31 tribes, governed by a chief who leads a council that makes the decisions. Wonder how many women sit on the top council? They always bring something new to the table.